I spent my lunch yesterday wandering around the Union Square farmers market. I was in search of purslane, but also wanted to ferret out the widest array of peak season ingredients. 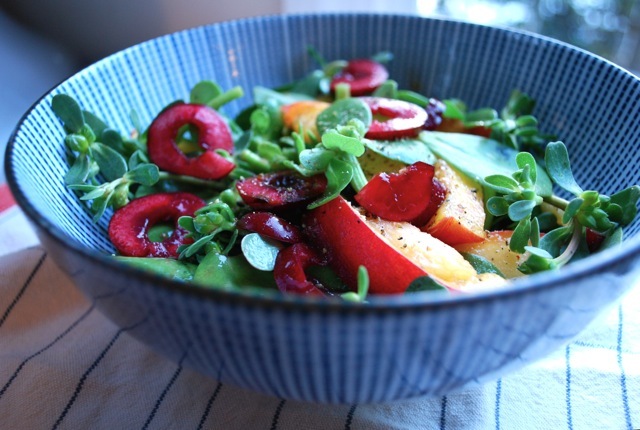 I found the purslane, big bunches of herbs, peaches (buzzing with bees), and the last of the season's cherries. The benefits of purslane have been covered here before. Apparently a weed, it is very healthful with a ton of omega-3 fatty acids. Since it's a succulent, it is extremely hardy. The thick leaves handle the weight of ripe summer fruit very well; they also can take on a ton of acidity without wilting in the least. Tender purslane is robust, without being chewy or fibrous at all. Since salads are especially flexible, use this recipe as a guide for incorporating whatever seasonal fruits and vegetables you have around.